Vận chuyển hôm nay nếu đặt hàng trong 12 giờ và 30 phút! The Definitive Rupert Neve Channel Strip Rupert Neve Designs' Shelford Channel, over a half century in the making, is the definitive evolution of Mr. Neve's. A Whole New Vintage – Over fifty years in the making, the Shelford Channel is the definitive evolution of the original technologies in Rupert’s classic console modules like the 1073, 1064, 1081 & 2254, thoughtfully advanced and refined for the 21st century studio. The Shelford Channel is built around Rupert Neve’s first new transformer-gain, class-A microphone preamplifier in over 40 years, the “best-of-the-classics” inductor EQ section from the Shelford 5052, a tone-packed Diode bridge compressor, the analog power of variable Silk saturation, a new dual-tap transformer output stage for maintaining headroom or allowing the full driving of the Channel without clipping standard converters, and twice the operating voltage of vintage designs. With richly-colored tonal options for making bold statements with your music, and precisely-engineered detented controls for recall, the vintage-inspired Shelford Channel maintains the soul of Rupert’s classic designs with new levels of versatility, delivering what can only be described as the combined essence of fifty years of Rupert Neve’s designs. Rupert Neve's first new Class A, transformer-gain mic preamplifier in over 40 years makes its debut in the Shelford Channel. Rupert has spec'd this preamp with a direct-coupled transformer input; gain is provided by the custom transformer itself. The proprietary input transformer, and its meticulous integration with the surrounding Class A input amplifiers, plays an outsized role in the Channel's immediately recognizable sonics: punchy and creamy-smooth, with excellent isolation and vanishingly low noise. The Shelford Channel's front-panel hi-Z instrument input uses the same discrete Class A field-effect transistor with transformer topology as Rupert Neve Designs' acclaimed RNDI; for gain, however, it utilizes the new RN4012 input transformer directly into the mic preamp. This design provides astonishing clarity on hi-Z sources, with substantial low-end weight and silky-smooth high frequencies. The DI also gives you a passive thru output to feed a guitar or bass amp. The Shelford Channel's EQ section is a 3-band, custom-tapped inductor circuit containing Rupert's favorite bands from his vintage equalizer designs. The low-frequency band is primarily based on the 1064 — acclaimed for its creamy, resonant bass. Unlike the 1064, though, the Channel gives you added dimension, punch, and control over your low end by letting you use the LF band as either a peaking or a shelving filter. The midrange band is based on the venerable 1073 and is perfect for sweetening instruments and vocals while nudging them forward in a mix. "Proportional Q" response also makes it ideal for attenuating problem frequencies. The high-frequency band is a hybrid design with the best of vintage and modern attributes. It should be noted that this EQ is in no way a clone; it's a decidedly modern design using components and techniques that simply did not exist in the 1970s — for instance, the use of capacitor-based topologies to achieve sonic richness and enhanced control. 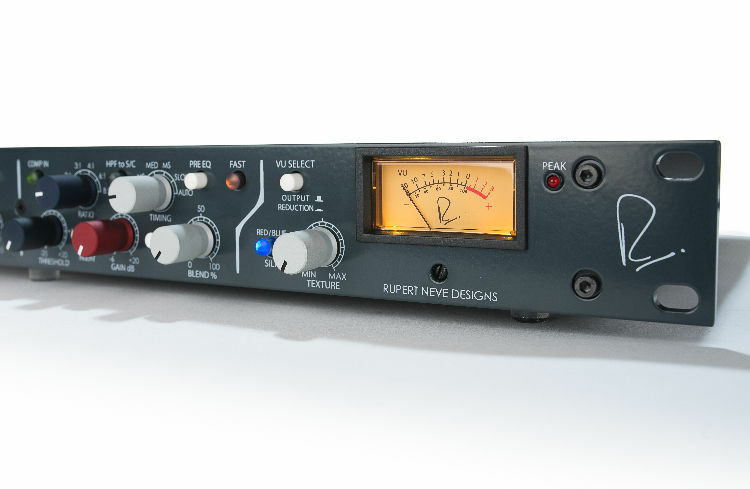 Like the Shelford Channel's inductor EQ and transformer-gain microphone preamp, the diode-bridge compressor/limiter is based on the topologies found in vintage Neve designs such as the 2254. It improves, however, on the early designs by the inclusion of full-wave rectification and a bevy of new control features. Although Rupert's vintage diode-bridge compressors were prized for their warm, punchy response, they were somewhat compromised by imprecise controls, attack-time inflexibility, low headroom, and high noise. The Shelford Channel's Super Diode-bridge Compressor delivers the attitude-packed, "in your face" sound of those classics, but with modern precision and flexibility — which makes it ideal on any source. Full Side-chain and stereo Link features are provided. Threshold: sets level where the compressor "kicks in"
The Shelford Channel's output stage serves up the inimitable sound of Rupert Neve's classic designs while providing far more tonal versatility. The dual-tap output for the RN2042 square-core output transformer provides both high- and low-headroom outputs without compromising performance. The high-headroom tap takes advantage of the Shelford's higher-voltage design, delivering a pristine sound without non-linear output-stage coloration at high levels. The low-headroom tap, on the other hand, lets you drive the full voltage range of the Channel to accentuate this non-linear harmonic content — without clipping most pro interfaces. For vocals, drums, guitars, bass, and other instruments, this output lets you hit the transformer's sweet spot, which can inject life into a recorded performance in a way that other effects cannot. The Shelford Channel is packing a secret weapon the classics never had: its output transformer features the Silk Red/Blue and Texture controls from the Portico II Series that let you tailor the harmonic content and tonality of the output stage. By engaging these controls and sufficiently driving your output, you can dial in delectable 2nd- and 3rd-order harmonic distortion (that's the good kind) and saturation of the output transformer, imbuing your tracks with juicy rich thickness (think: 1073 on steroids) — with no danger of overloading the output stage. The Silk Red mode emphasizes harmonic content generated by the source's high frequencies; Blue mode, conversely, works off the low frequencies. The Texture knob controls the amount of added harmonic content. Disengage Silk, and your output is pristine and modern, while retaining Rupert's bigger-than-life transformer sonic signature. Rupert Neve is an audio legend whose electronics designs defined the golden age of analog. Those of us at Sweetwater who have had the privilege of working on a Neve 8078 or its predecessors can attest to the fact that Neve's Series 80 consoles were indeed the pinnacle of hand-wired analog mixing desks. Mr. Neve has remained at the forefront of audio-circuit innovation for over half a century, and his current company, Rupert Neve Designs, continues to advance the state of the art with cutting-edge products that sound incredible and intelligently address the challenges of the digital age.